As another school year comes to a close we will soon be sending our students home for a much needed respite. It’s time for them to play, focus on developing their nonacademic talents, and enjoy a break from the everyday routine of school. Unfortunately, we know that many of our students will return to school in the fall in need of 4-6 weeks of review to get them back on track. This learning loss is commonly referred to as “the summer slide”. Teachers hope that students will continue to read, write and participate in real world learning experiences that they can bring with them to the classrooms in the fall to help them be successful. Unfortunately, many students do little during the summer months to stay academically stimulated in the area of math, often because parents lack resources and time to help. LearnZillion is a Cool Tool that can provide parents and students with opportunities to retain math skills and perhaps even make gains during the summer months. 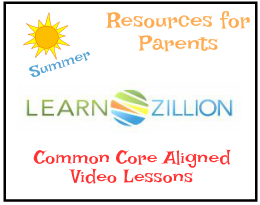 LearnZillion is a free resource of Common Core aligned lessons that use narrated video for instruction. The pause button allows students to tackle the learning at their own pace, while built in learning supports make Learnzillion an effective instructional tool that addresses a variety of learning needs. 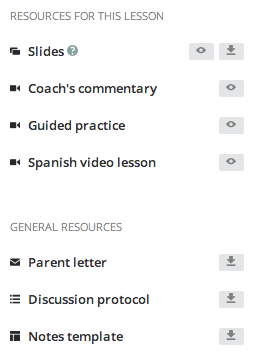 A Coach’s Commentary on the side of each playlists provides parents with additional information and support. 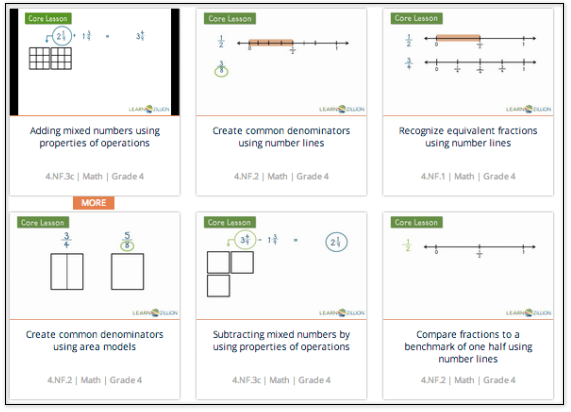 The math lessons provide guided practice opportunities and they also offer a downloadable form for taking notes. This is a nice tool for independent practice over the summer and one that many parents would appreciate having. Narrated video lessons for students aligned with Common Core Standards and identified by skill. A notes template for student use. Quick access codes associated with each lesson. Playlists of resources focusing on a particular standard. Teachers can use the handy parent letter to provide students and parents with targeted practice on skills they need to master. 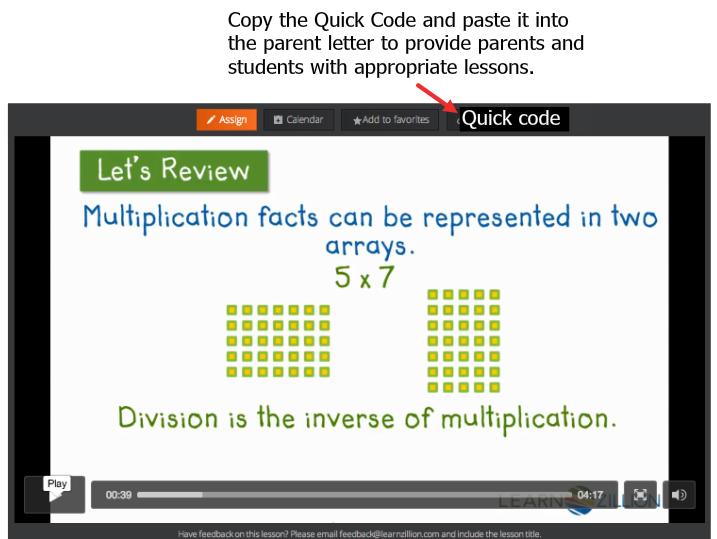 Just select the appropriate lessons and click on Quick Code, then copy and paste those into the parent letter. Teachers can take it a step further and create a summer class for students and assign a series of lesons and quizzes for individual students. Use the calendar to assign lessons and due dates to students for completion over the summer. For as long as I can remember I have been an advocate for helping teachers understand the stages of technology integration in order to effectively use tech as a tool for learning. I’ve adopted a few different tech integration models over the years, discussed the ideas with administrators for use as a starting point for tech integration, and kept the ideas front of mind as I invent and discover new ways for using technology as a tool for learning. Discussing the stages of tech integration has led to some thought-provoking and inspiring conversations, but the ideas have not gained a lot of momentum in my face-to-face teaching environment until now. 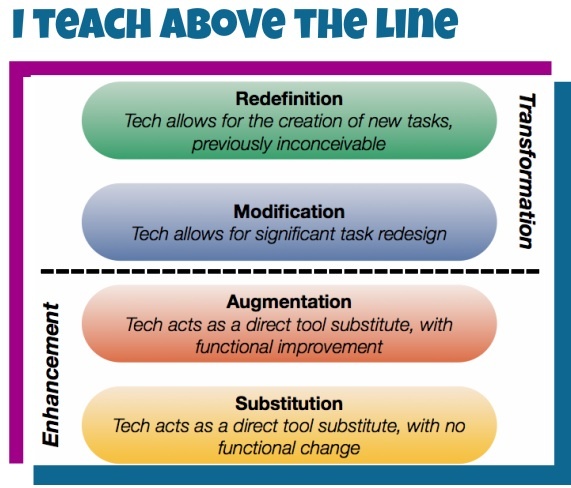 As many districts jump on board with iPad implementation, Apple’s use of the SAMR model as a framework for tech integration presents a consistent, clear and powerful message that is spreading! I recently met Shannon Soger, 1-1 coordinator and instructional coach from D100 in Chicagoland, who shared a brilliant PD strategy and challenge used with the Fab 40 teachers in her 100% 1:1 school. The goal for teachers working within this amazing environment is to teach above the line. Of course this simple mantra and point of reference serves as a quick and easy self-evaluation tool. Teaching above the line is a clear and attainable goal to strive for. Thanks Apple, and thank you Shannon for leading the way! Last fall I was consulted by Neil Vineberg, CMO of ThingLink, to think about ways to encourage teachers and students to use the flexible interactive tool in preparation for the ThingLink Interactive Image Contest. My advice and approach was to create and publish a comprehensive wiki of resources, known as The ThingLink Toolkit. At that time, ThinkLInk was a tool I was using to create my own resources, but in order to make the tool appealing to classroom teachers, I knew I would have to make connections to help them meet their busy teaching demands. If you haven’t heard by now, the plate is full and right in the middle is a strong push to begin implementing the Common Core State Standards in our classrooms. 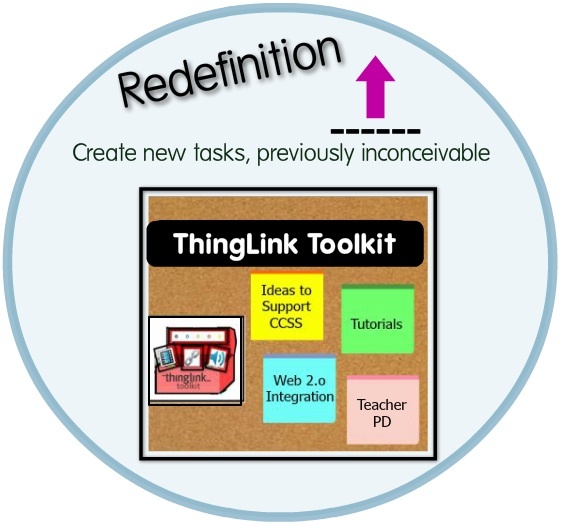 With increasing expectations to implement the CCSS, I decided to create samples of student projects that weave digital tools into the Common Core to demonstrate the flexibility of ThingLink as an effective and efficient tool for constructing knowledge. To create the samples, I had to dig deeper into the Common Core myself and embrace it. I must say the experience of designing The ThingLink Toolkit was challenging and exciting because it stretched my boundaries and required me to research, explore and think a lot. In the end, I created some resources I am very proud of and also a few duds, of course, but I realize that creating this toolkit of resources was an exercise in teaching above the line, and the samples I created demonstrate my ability to work at the top level, redefinition. The ThingLink Interactive image contest was launched and recently the deadline for entries has passed. Students have created some amazing interactive images that required them to engage in CCSS aligned learning experiences. They used higher order thinking skills to design, present, and share ideas. They redefined concepts through multimedia. The end results are impressive, but the real gain is in the deep learning that occurred during the process of creating their images. Please view, explore and touch some of the student entries on the contest site and see how ThingLink can be a powerful tool for teaching and learning, then try it yourself. Twitter is a resource I often tap into. I am not a Twitter expert, nor do I utilize Twitter to it’s greatest potential, but it is certainly one of my go to tools when I’m looking to share and learn from the ideas of others. Many people don’t understand how Twitter can work efficiently. Many people don’t think they have time for Twitter. Perhaps they don’t. We all have different learning styles and preferred methods of information gathering. We must all choose the tools that work for us and Twitter is in my toolkit because it works well for me as an efficient and effective tool for collaboration! Twitter has allowed me to connect with many amazing, talented and connected #EdTech stakeholders across the planet. Twitter is efficient. Words are well chosen, the language is constantly reinvented, and of course links to resources are the treasures. I recently had a quick Twitter conversation with Naomi Harm, a talented innovative educator and EdTech consultant from Minnesota. Naomi and I have never met face to face, but we are certainly connected. We learn from each other, we share each other’s resources and ideas, and we collaborate quickly and efficiently. I’ve known Naomi to be an iPad expert for many years and since I have just jumped in to the iPad journey in my school, I grabbed the opportunity to ask Naomi for her for guidance. Here is our 15 minutes conversation, filled with treasures. Ah, yes…the things I can do with this information! Thanks Naomi. Keep on Tweeting! @nharm Hello Naomi. Can you share your best iPad advice in 140 char or less? iPads are coming my way and I value your expertise. @soxnevad Tap into the app repository of Appitic http://www.appitic.com iPad Lessons http://pinterest.com/techchef4u/ipad-lessons/ … for brillant ideas. Take care! 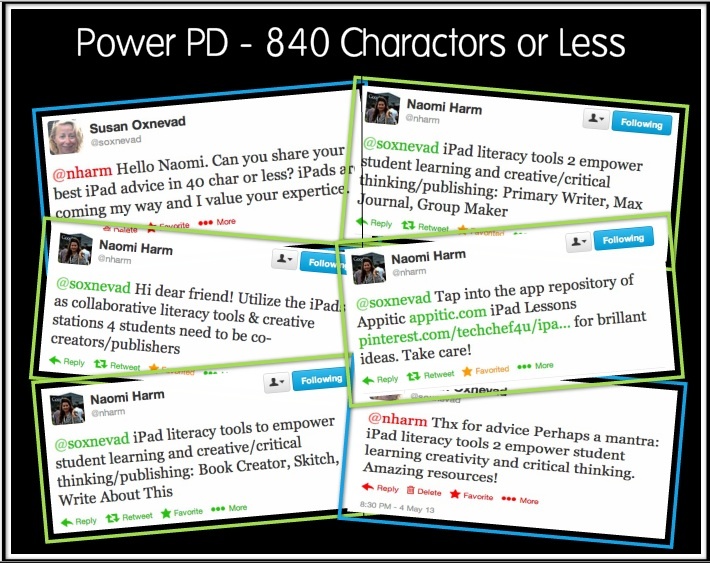 @nharm Thx for advice Perhaps a mantra: iPad literacy tools 2 empower student learning creativity and critical thinking. Amazing resources!